Robert Wassick was born in Nelson in 1928 and died there in 2016. During his life he spent many years traveling and working in East Asia, including Japan. In the late 1950s he taught English for two years in Tokyo, and while on vacation he visited Shuzenji primarily for the hot springs but also to learn pottery. He made the yunomi jyawan in Shuzenji (now part of Izu-shi), and decorated it with Mt. Fuji. His sister believes that it was made in 1958. She donated to the Friendship Society several of his memorabilia, in care of Jim Sawada. 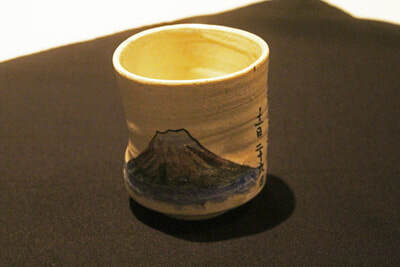 Jim suggested that the yunomi jyawan be returned to Shuzenji and become part of the Nelson collection at Niji no Sato. 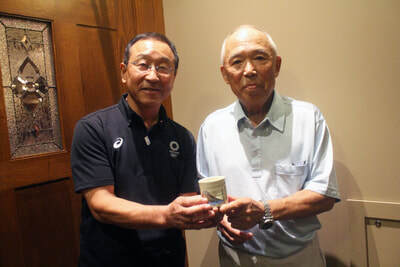 Members of the two friendship societies welcomed the idea and during the visit of the delegation from Izu-shi, the tea cup was presented to Hiroyoshi Suzuki, President of their association who took it back to Shuzenji. It is intriguing that there was a connection between Shuzenji and Nelson 60 years ago. Malcolm Fitz-Earle and Jim Sawada. Thanks to Rachel Greenaway.